Before unionist readers have conniption fits about this being another diatribe about Scottish independence, allow me to point out that the title is the English translation of the Province of Manitoba’s motto: GLORIOSUS ET LIBER. And why should I be citing such obscure mottos? Because yesterday was the 70th anniversary of a little-remembered (outside Canada) piece of British military mishap/incompetence in which large numbers of brave men lost their lives—arguably unnecessarily. Recently, we Scots are being forever told that we are part of “the most successful union the world has known”, with the subtext of having come through two world wars together. While demonstrably true, let’s not kid ourselves that we were the only country to answer the call when the British interpretation of ‘civilisation’ was threatened. Despite already being nominally independent as ‘Dominions’, Canada, South Africa, Australia and New Zealand were quick to side with Britain on both world wars and to send their young men to fight alongside. This blog has already covered the pointless sacrifice of young Australian lives on the altar of British military incompetence at Gallipoli in Lions Led by Donkeys. Although Canadians lost 67,000 killed and 173,000 wounded, out of an expeditionary force of 620,000 in WWI (a tragic 39% casualty rate), this was attributable to the general stupidity of Hague and his generals from which all troops suffered there, not just Canadians. In WW2, Canada was equally quick to offer support supplying a huge naval effort in the Battle of the Atlantic and thousands of flying personnel in Bomber Command. But the 1st Canadian Division arrived in the UK too late, luckily, to be sent to France prior to Germany’s crushing defeat of France and the Dunkirk débacle (let no one call it a triumph—we were lucky; our men and the little ships were brave; the Germans, for once, were stupid). Which left the Canadians as the only competent and equipped military unit of any size to defend Britain in the dark days when the Sealion invasion seemed a real possibility. Once Hitler’s deranged strategy threw the Wehrmacht’s 180-odd divisions at the USSR in June 1941, Churchill (under heavy pressure from his new ally Stalin) was urging his military to open a second front. Sanity prevailed and a compromise invasion of North Africa was agreed for late 1942. But, since invasion of France would be a prerequisite of any defeat of Germany, some kind of major raid to test theories and equipment would be necessary. This was scheduled for the port of Dieppe in August 1942. As the most coherent units available (such British units as could be spared had been sent to the Middle East and Singapore) Canadians—mostly their 2nd Division—made up the bulk of the troops involved. The plan was conceived by South-eastern Command’s Montgomery, a competent enough general if given enough force but not an innovator. It involved an amphibious landing under and direct assault on the cliffs on either side of Dieppe harbour. Support for the operation was weakened from the plan: a massed bomber raid was reduced to avoid French casualties, destroyers replaced battleships for providing support bombardment (52lb shells instead of 2,000lb shells) and a parachute landing to capture major shore batteries dominating the beaches was replaced by commandos landing on the same beaches. 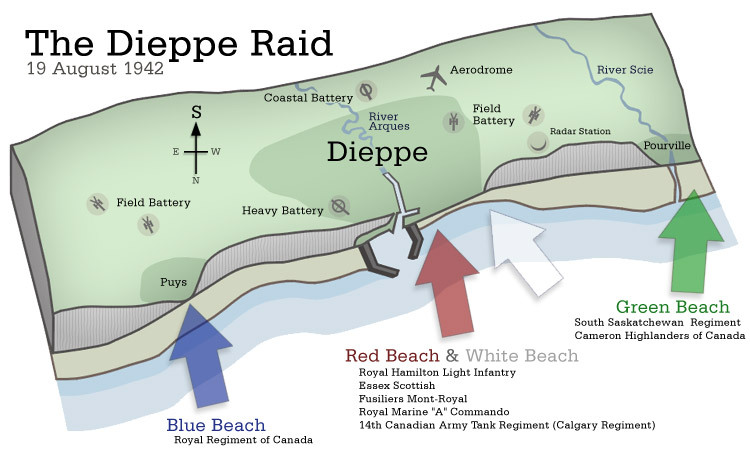 Dieppe was defended by the German 302nd Infantry. Mobilised only two years before and by no means a ‘crack’ unit, this was still a fully-equipped regular division of 14,000 men under a competent Major-General von Bogen, strengthened by flak and coastal artillery units and well dug in behind barbed wire obstacles all along the beaches. While obstacles were not as comprehensive as two years later at Normandy, the defences had been alerted by French spies and good intelligence. Photo-recon Spitfires only had to cross the Channel to report back on all this but the plan went ahead anyway. 237 ships deposited the assault force on the morning of August 19th. Only No 4 Commando had any success, destroying the shore battery at Varengeville. Those at Pourville, Puys and Berneval, along with field artillery, dug-in machine-guns and mortars on the heights, shredded the Canadians on the shingle beaches below, including 27 of the new Churchill tanks, none of which made it past the sea wall. By 11am, the whole operation was abandoned and survivors taken off as best they could under heavy fire. Casualties from the raid included 3,367 Canadians killed, wounded or taken prisoner, plus 275 British commandos. The Royal Navy lost one destroyer and 33 landing craft, suffering 550 dead and wounded. The RAF lost 106 aircraft to the Luftwaffe’s 48. German casualties? 591. The German Fifteenth Army (responsible for the sector) conducted an investigation into lessons to be learned from the operation, as well as from two dozen samples of Britain’s latest tank with which they were presented. They thought little of either British planning or their latest tank. It triggered the building of the Atlantic Wall and eventually having no less a figure than Rommel put in charge of it. Much has been said since about the fact that the Dieppe raid was a necessary precursor to the great amphibious operations that were to follow, in terms of the lessons learned and experience gained. However, it needed no debacle like Dieppe to learn those lessons. Unsupported frontal assaults on a competent, dug-in enemy are never part of sane tactics. General Sir Leslie Hollis (deputy head of the Military Wing of the War Cabinet with direct access to Churchill) judged the operation a complete failure, and the many lives sacrificed in attempting it were lost with no tangible result. But the whole sordid episode bids fair as another glaring example of ineptitude that tarnishes any glory deriving from the British Army’s exploits through history as part of this union—and raises considerable questions about a relative indifference from their staff officers to casualties, proportional to the distance from the Home Counties that soldiers involved in any given operation originated. It’s a wonder Canadians are as fond of the British as they are. But they’ve had their own country since 1867—glorious & free. This entry was posted in Politics and tagged Dieppe; Canada; military incompetence. Bookmark the permalink.